A new Tuesday, a new project is typically how it works. However, with the Princess Anna Halloween costume in the works, I split up the 12 Projects for Tuesday to cover 2 weeks! 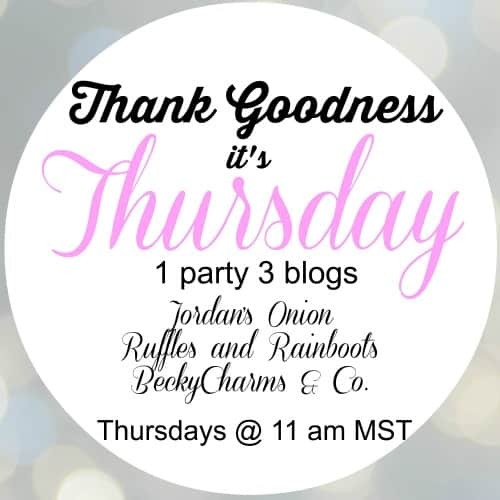 If you missed Part 1, check out the post here! Middle school is a time of transition, for both students and parents. Middle school differs in numerous ways from Elementary school: one of the most apparent is increased pressure on organizational skills. The above example shows, not only the difficulty in my son’s ability to stay on top of what is due and when, but the reason why! It is Complicated! 6 separate classes, with 5 separate teachers. Due dates that differ throughout the week. 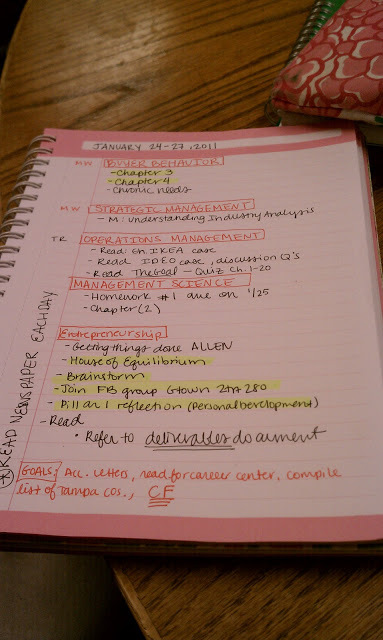 Varying types of work due and assignments to complete. 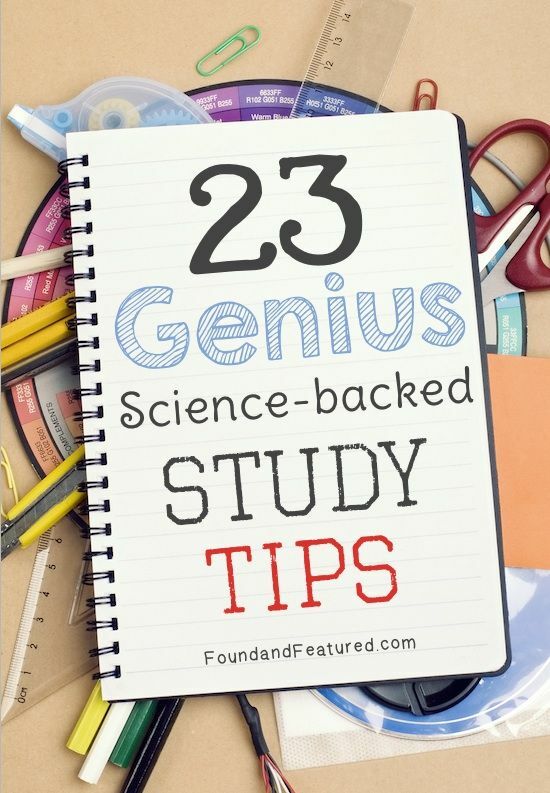 This week I want to focus on Study Habits and Organization Skills! I love infographics! I also love flashcards. While there has been some debate as to whether they work or not, and for how long, it is hard to deny the results. While cramming before a test is not desirable, the benefits of regular flashcard use is worth the try. See the following infographic for more flashcard facts! 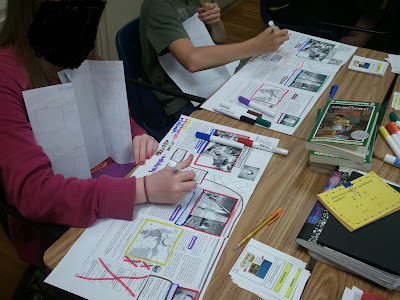 I found out about Textmapping on The Middles School Mouth, a super cool blog by the way! However, Texmapping originated here. It is a super cool method for reading comprehension that can only be explained by checking it out! Hint: It is all about scrolls! I love this article from www.thecollegeprepster.com. She really hits the nail on the head when she mentions that half the battle is paying attention in class. The other half is homework/ studying. She advises to look ahead on Friday- even when she thinks she has nothing due. It is always best to look ahead and make a weekly plan-of-action. If you can, find out when major tests are due (as they tend to come at the same time!) and plan your study time accordingly, so you are not studying for all tests at once! I said it last week, and I will say it again: Color Code Everything! Either as the example shows below, or my favorite, a color for each class. My favorite? Space it out: A relatively new learning technique called “spaced repetition” involves breaking up information into small chunks and reviewing them consistently over a long period of time. Especially when dealing with ADHD! 12. Praise for effort, not intelligence! 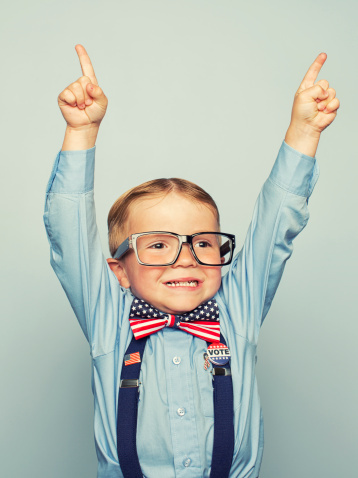 Kids praised for intelligence often see being smart as something you are born with. Studies have shown that when kids are praised for their natural intelligence they often choose easier tasks to avoid failing. In contrast, kids who are praised for their efforts tend to view being smart as something you work hard to be. So next time you praise your student, praise their efforts! It is no secret that middle school is a time of transition. Students are leaving the familiar for the new, dependent learning becomes increasingly more independent, and social hierarchies are magnified. As a mother of a first year middle school boy (with ADHD to boot! 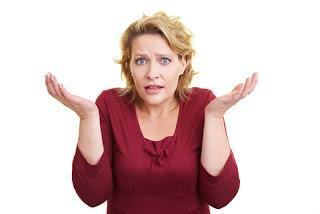 ), I have learned that the middle school transition also applies to parents! The homework routines that we as parents have learned to enforce seamlessly during the elementary years, often times do not smoothly evolve into successful middle school study habits. Last Friday marked the end of the first 6 weeks of 6th grade, and upon reflection I realized that my son was not prepared for the level of organization needed in order to succeed. More importantly, I was not prepared to help him become more organized! During the last 6 weeks, there have been tears, frustration, and anxiety, as we hastily prepared for major tests. Moving forward, we must become more organized! The following is a list of organization tips and tricks for school and chores. Some I have tried, and others I hope to implement as soon as I possibly can! There are so many wonderful ideas on Pinterest for homework stations. So many, that I could hardly choose the best one for my family. We have had many different stations over the years. Often times they start out beautiful and seem to work wonders, then, a few months into the school year, the station resembles a junk drawer instead of a system of organization! 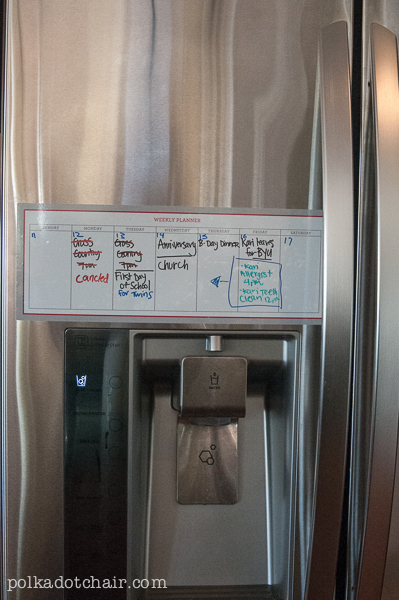 In my opinion, the best implementation for homework, chores, and general schedule organization has been the magnetic or sticky calendars and daily planners for the refrigerator. That way, you walk past it numerous times a day! 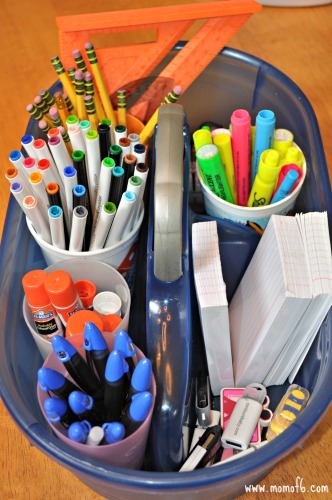 The homework caddy is a brilliant idea. It takes the mess of the drawer and makes it portable! No more multiple trips to the cabinet to “get a pencil”, everything you need is all there! Determine the supplies your student needs and make sure the caddy is stocked! While this is being carried over to the middle school years, this is especially fun in the elementary years as well. 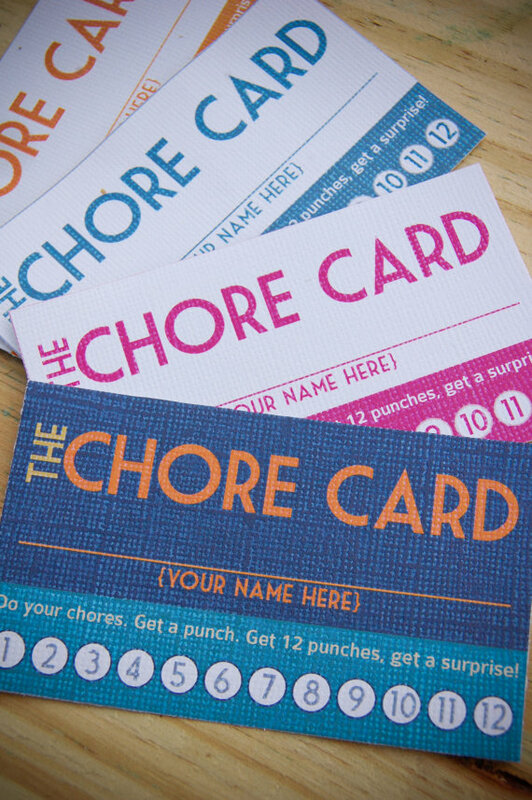 This is tried and true and has made doing chores fun in our family! 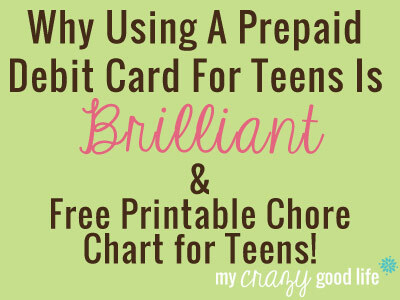 After reading the post “Why Using Prepaid Debit Cards for Teens is Brilliant” on mycrazygoodlife.com, I went out and got my son a debit card. I opted for a regular debit card, tied to my account, so that I could monitor what was spent and make easy (and free!) transfers from my account to his for allowance and rewards. It was one of the best decisions I ever made. No more searching for cash. No more delaying the reward. It can also work in the reverse if money needed to be taken back as a consequence (however, we tend to focus on positive rewards for positive behaviors). It also helps my son to develop a sense of responsibility and money management, as we go over the charges monthly and he transfers money into his savings as well. What can’t you do with Washi tape? 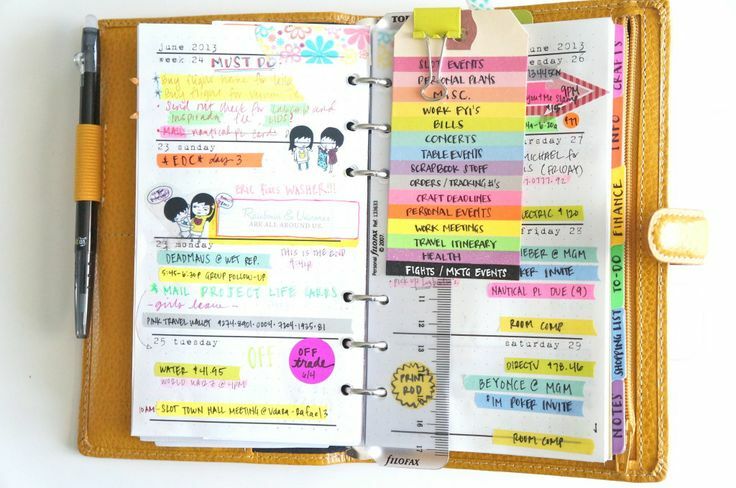 Washi tape is so fun, it will make planning enjoyable for anyone! 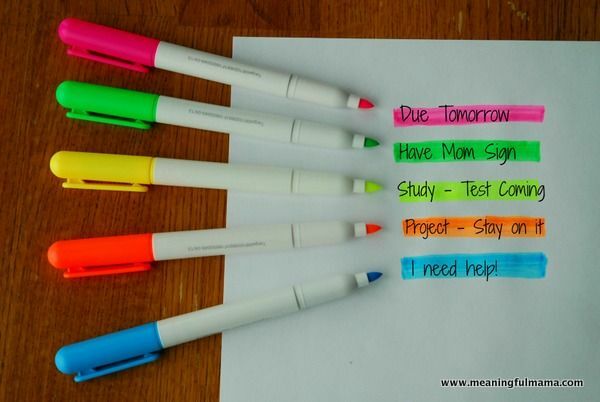 Each subject has its own color, so you can see at a glance what is due when. This is something I have been doing since I was in middle school! Except, I used highlighters! It is that time of year again! It is hard to pinpoint exactly why Fall is my favorite season of the year. Perhaps it is the lovely change in weather, or the prospect of so many family Holidays on the horizon, but there is one thing I know for certain: I love Fall! Now that Fall is finally here, I have begun collecting all my favorite decorating inspirations. As my first post in my new campaign, 12 Projects for Tuesday, I am more than thrilled to share my Fall inspirations with each of you. The following is a list of 12 Fall Projects that I have handpicked. Each project is linked to the original source, many of which have excellent tutorials. 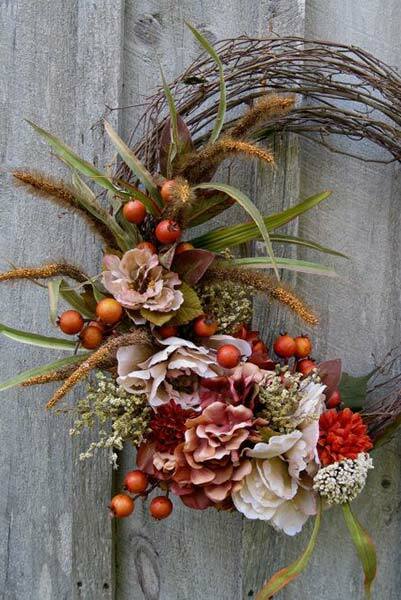 This beautiful wreath can be made in minutes with step-by-step instructions from anightowlblog.com. 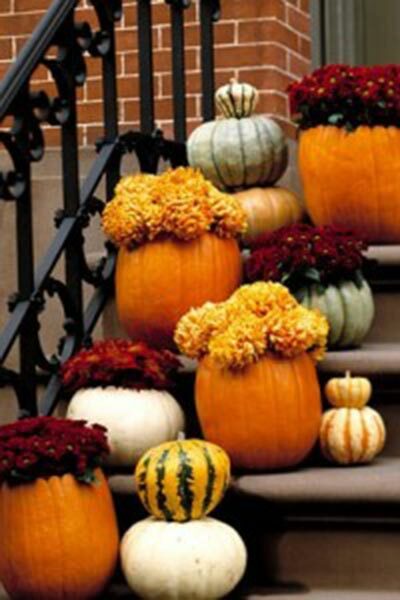 These front porch pumpkins offer beautiful color combinations to decorate your home and garden with for Fall. As soon as our local pumpkin farm sets up, I am grabbing these unique pumpkins for our front porch! 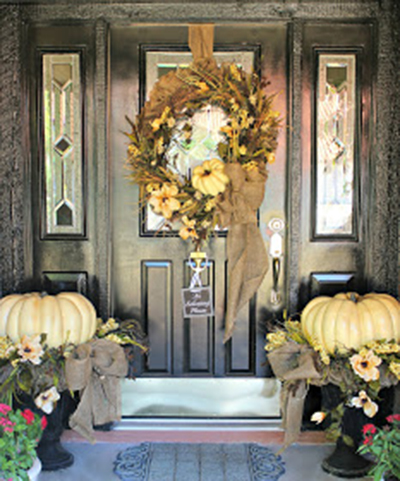 A Fall front porch that can easily transition from Halloween to Thanksgiving and all your other Autumn desires. What a lovely concept. 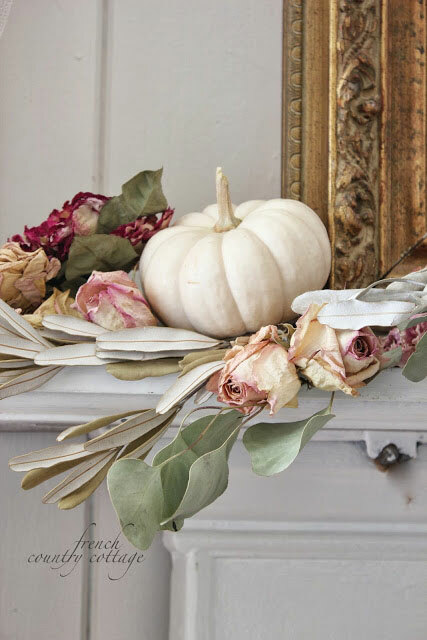 Simple touches and feminine charm make this site a must see for unique Fall decorating ideas. 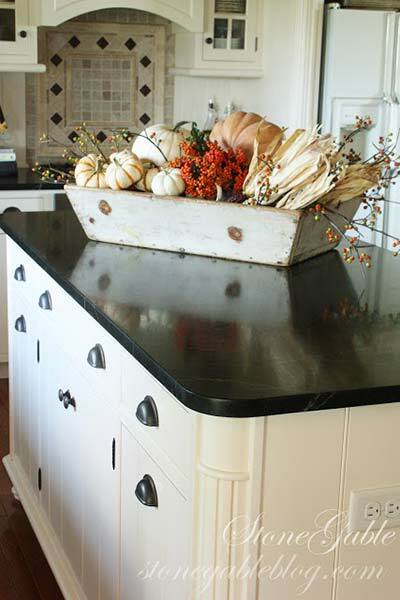 An upscale, country kitchen centerpiece is on my list of DIY projects this season! 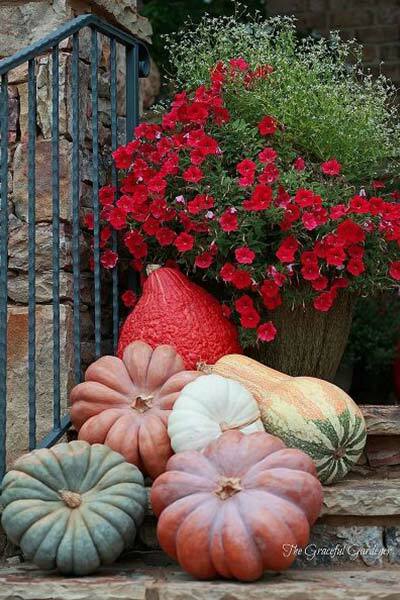 Painted pumpkins can transform the ordinary into the extraordinary. 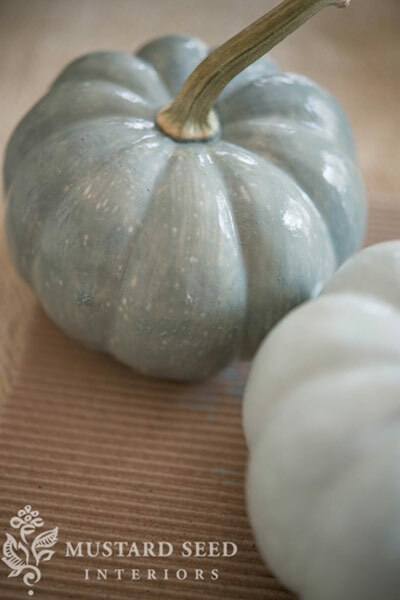 This lovely shade of blue is perfect for a Fall centerpiece. If you need a wreath, but don’t have the time to do-it-yourself? No need to fret! 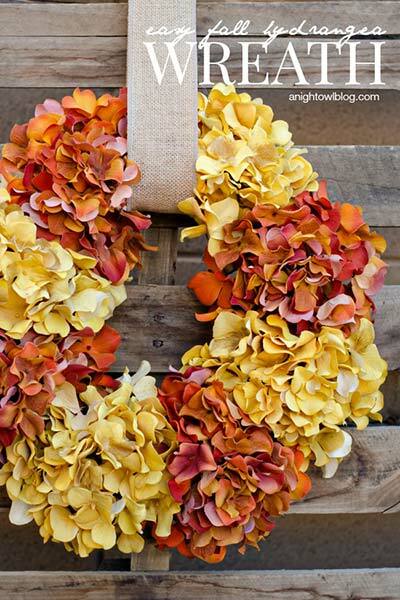 This Etsy shop has some of the most beautiful Fall wreaths I have seen! What beautiful statement colors are found here! This front porch really showcases the colors of Fall. Often overlooked, yet equally important: the entryway. This is definitely on my to-do list! I cant get enough of beautiful, uniquely colored and shaped, pumpkins! The tiered look is something I would like to try on my own sloped front walkway. 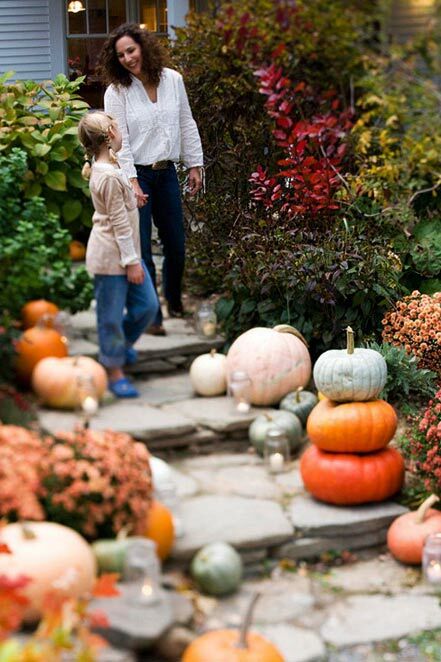 In decorating for Fall, we can’t overlook the wonderful aroma of Autumn scents. 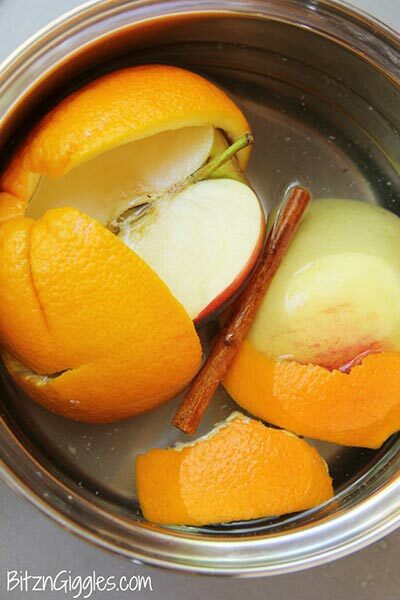 I love the smell of Apples, Cinnamon, and Oranges to brighten my mood and make my home feel special. 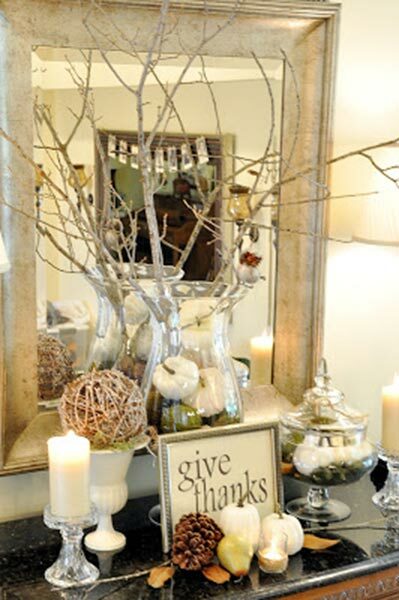 This decorating tip is just the cutest thing ever! 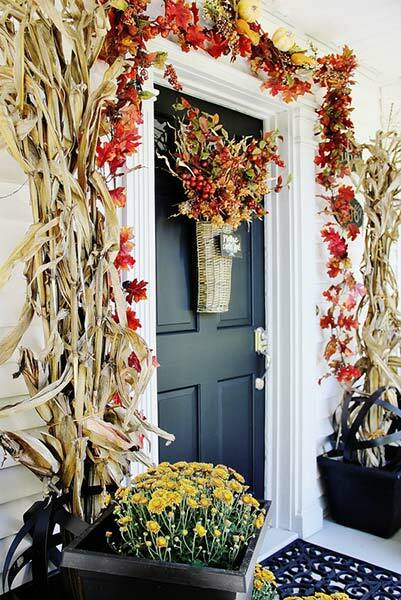 For more elegant Fall Project ideas, make sure you check out my very own Fall Porch Makeover and Autumn Flag Banner Tutorial Here. When we decided as a family to adopt rabbits into our life, the first and foremost decision we had to make was: indoors or outdoors? In the house or in a rabbit hutch? There seems to be a philosophical debate on whether or not rabbits are indoor or outdoor animals. There are numerous websites dedicated to the philosophy of “house rabbits” detailing the reasons why indoor environments are vital to the well being of bunnies. Many of these reasons are related to social interaction, harsh outdoor climates, and an increased lifespan in the home. The philosophy of house rabbits tends to be very adamant that keeping a pet rabbit indoors is the best possible outcome for both the pet and the pet owner. 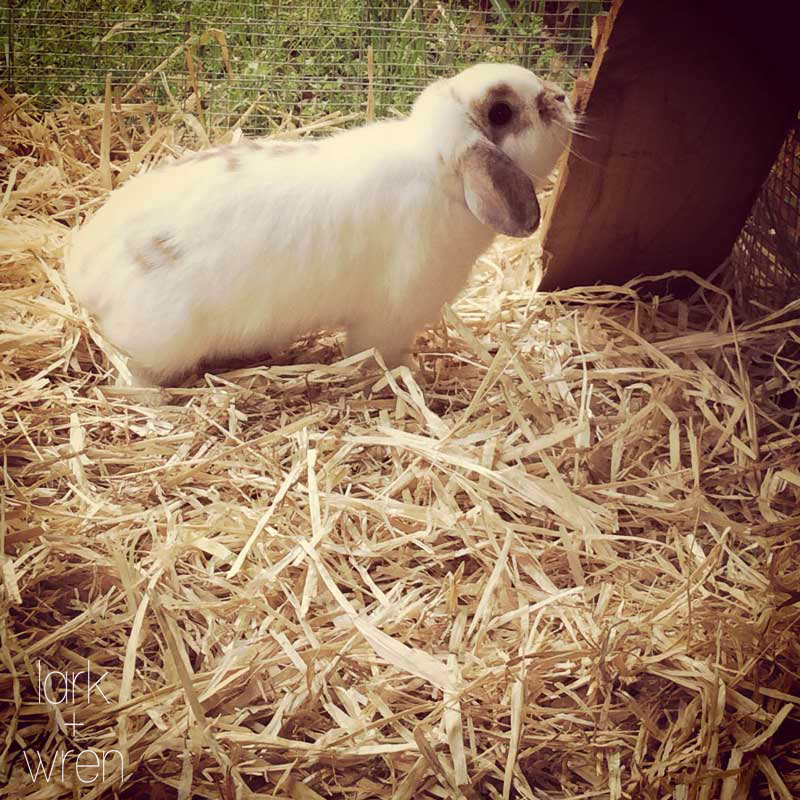 The other side of the debate tends to agree with all the positive aspects of indoor habitats, yet recognizes that rabbits are rabbits and, if properly cared for, can live a happy life outdoors in a rabbit hutch. After careful debate, we decided that we would keep our rabbits outside – with the resolve to play with them outside every day. 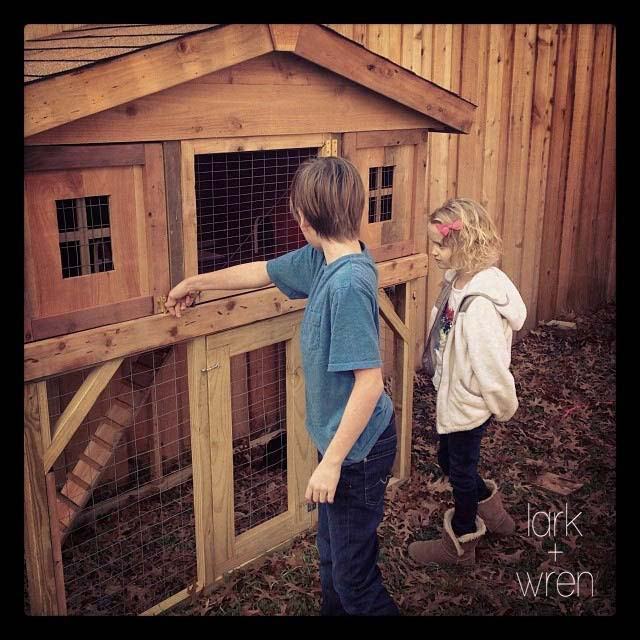 However, we wanted to make sure that they had ample space and excellent accomodations, so we recruited my father to design and build a DIY Rabbit Hutch: what we now refer to as the “Rabbit Mansion”. My dad’s philosophy is “use what you have”. 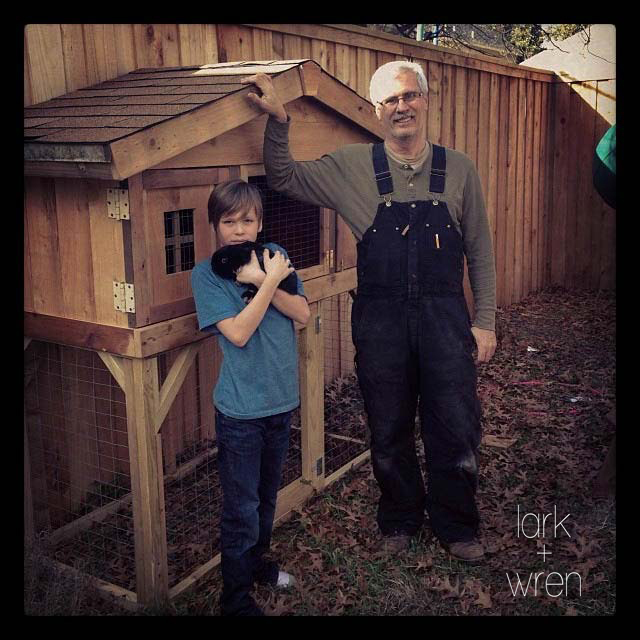 In the case of the DIY Rabbit Hutch, we used wood left over from our newly assembled fence, hinges from old cabinet doors, and scrap wood from various projects for the top addition flooring and stair case. The DIY Rabbit Hutch is built in two pieces: the top piece fitting on the bottom piece like a lid to a pot. Needless to say, the kids were thrilled with the new addition! The rabbits were too! For more woodworking projects by my dad, please see our “Tufted Headboard Tutorial” or visit his website, Masterwork. 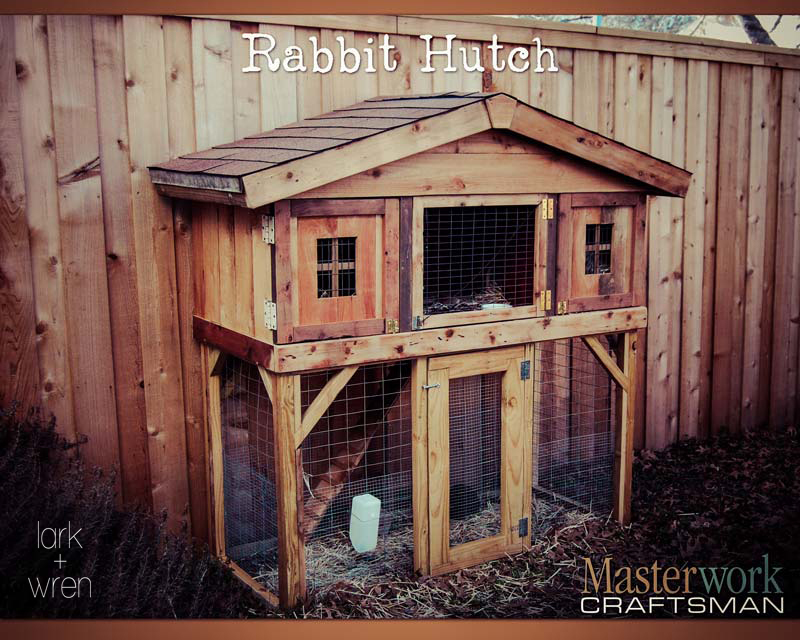 A DIY Rabbit Hutch Blueprint Printable PDF is here! Visit our products page for more information! 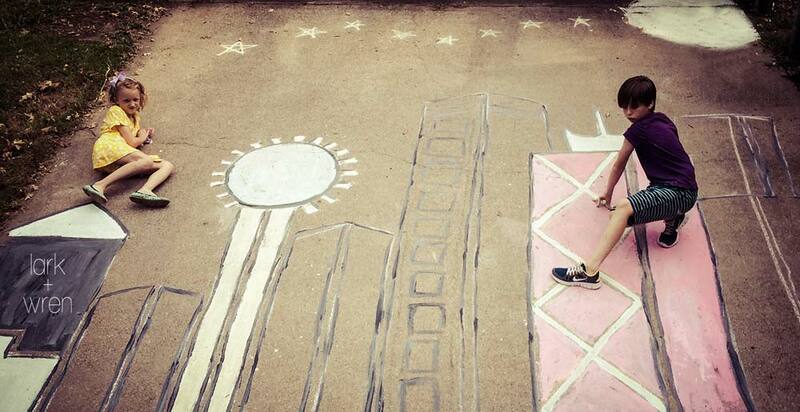 Earlier this year, the kids and I succumbed to yet another pinterest phenomenon: Sidewalk Chalk Photography. 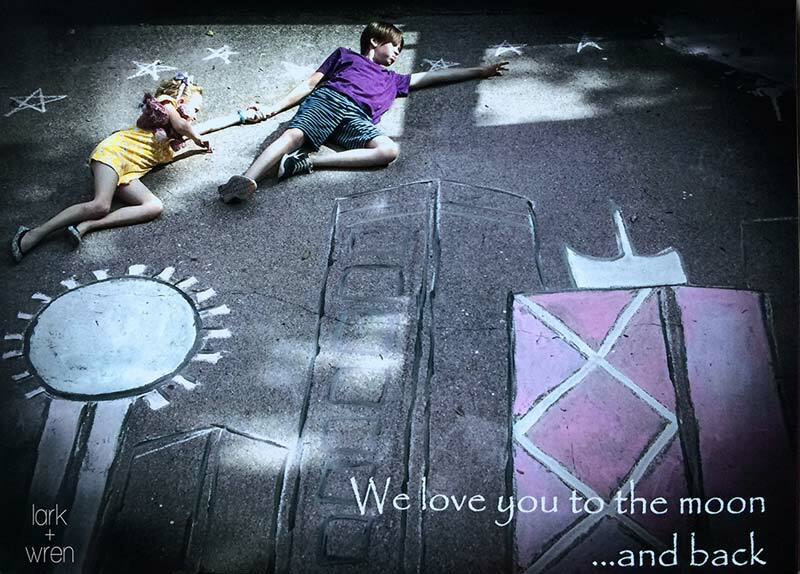 In the heat of a Texas June day, we decided to make chalk paint, paint the driveway in the likeness of the Dallas skyline, and make one of the most adorable Father’s Day cards ever! To make: Mix roughly 1 cup cornstarch to 1 cup water with 10-12 drops of food coloring (or until the desired color). We had no problem washing away the color when we were finished. However, we used Tempura Paint in black for the outline, and that took about 2 weeks to fully disappear. We were ready to pose for the photoshoot! All I needed to do was position the ladder in the alleyway in order to get to a perspective where the driveway was flat. I never was able to find this position, but it was close enough! Posing the children was the most enjoyable part of the whole event. The kids loved coming up with silly poses and trying them out. However, we had to wait until 5:00 to get the shots as the concrete was so hot! Which gave us only 30 minutes before dad arrived. We quickly added stars and a moon to create the look of night and took photos in 30 second bursts! Oh the joys of a Texas summer. Hot enough to fry an egg! In the end, with a little photo editing to darken the photos and some text from a beloved book, we had a magical gift to give a wonderful father. 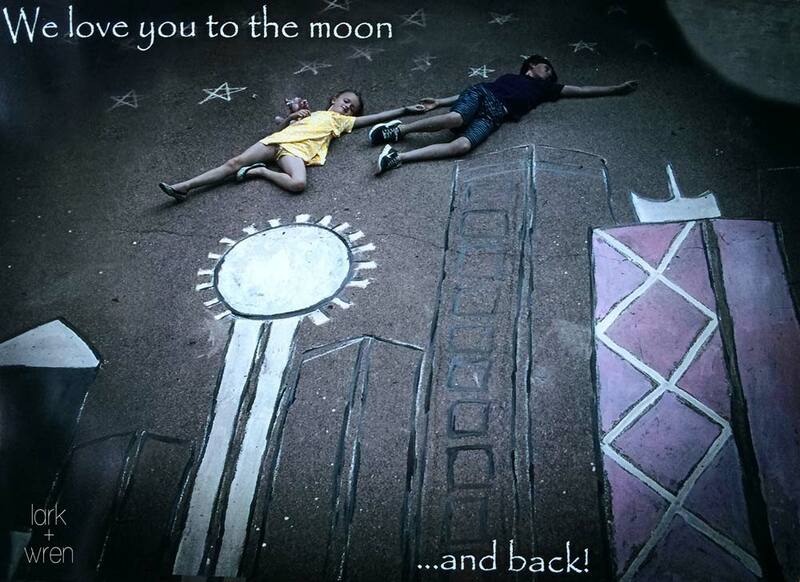 When we were done, we just washed the chalk away. 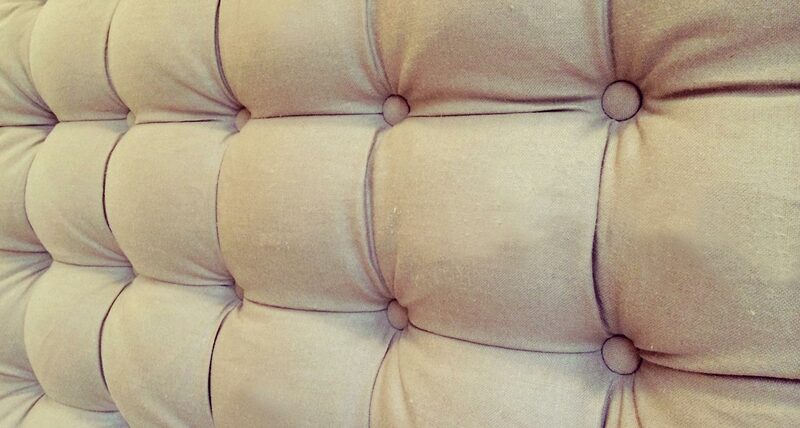 Tufted headboards are a little girls dream, and in my case maybe an even bigger dream to make one. When I saw the Eliza Tufted Headboard from Pottery Barn, I knew that I must have one for Cadence. But with a price tag near $1,000, I turned toward my inner creativity (and my father!) to make one from scratch. I had never made furniture or reupholstered anything before, but I knew with the countless tutorials on pinterest that we could succeed. My favorite tutorial came from The Idea Room. 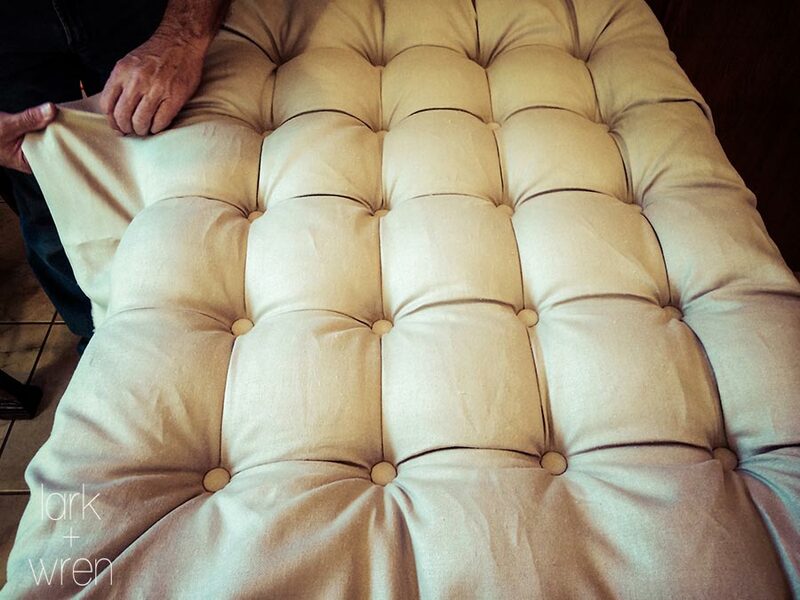 While I knew I wanted a deeper tuft than the one shown, I loved the step by step instructions, not only for the tufting, but the headboard frame as well. Originally, a tufted headboard was all we were going to attempt. However, once I involved my dad, we got a whole entire bed frame! 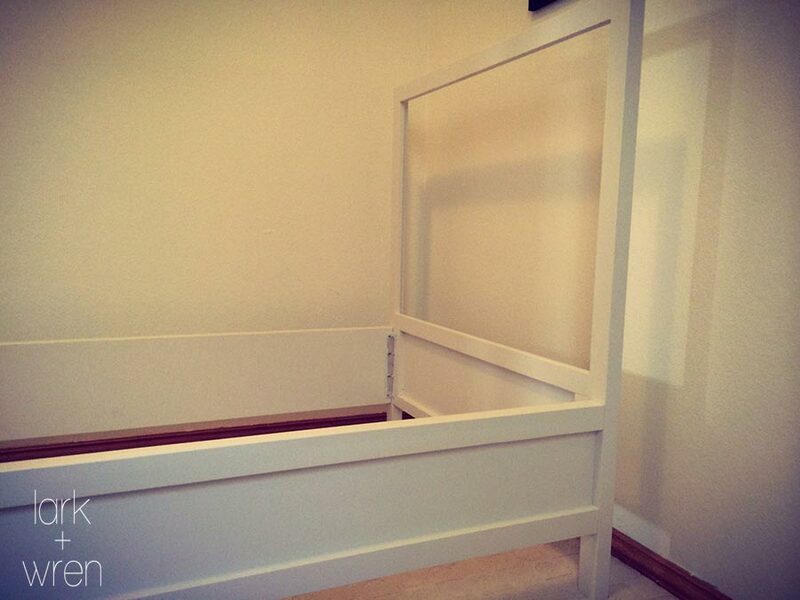 As I was not the one to make the bed frame, I cannot explain in detail how it was done. 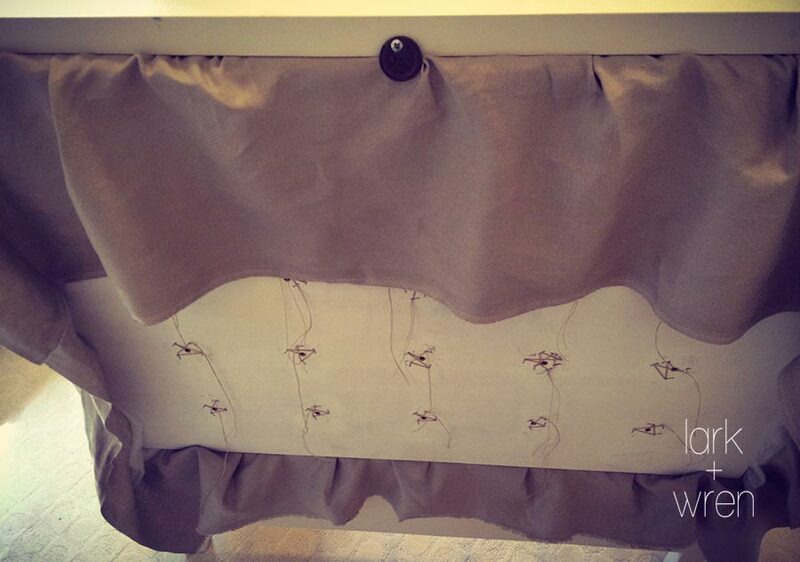 However, I can show step by step how the headboard was constructed as well as do over points along the way. Note: While the bed frame was made and prepped by my loving father, I had the pleasure of painting the bed which ended up with 3 coats of paint! My husband, of course, occupied the children during this process. Make the frame. 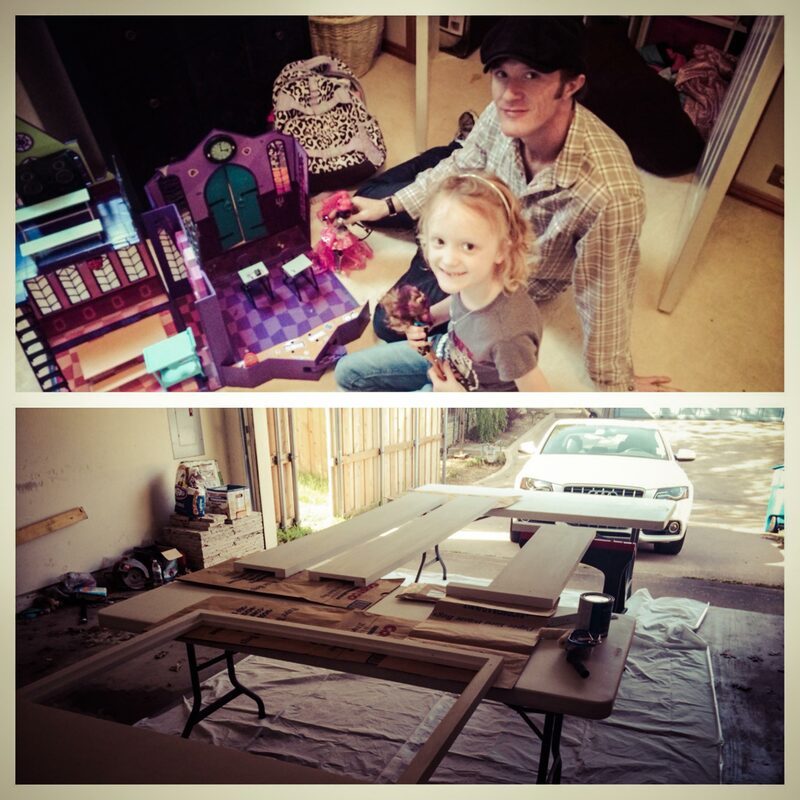 Follow the instructions from The Idea Room and cut the MDF board to your own specifications. 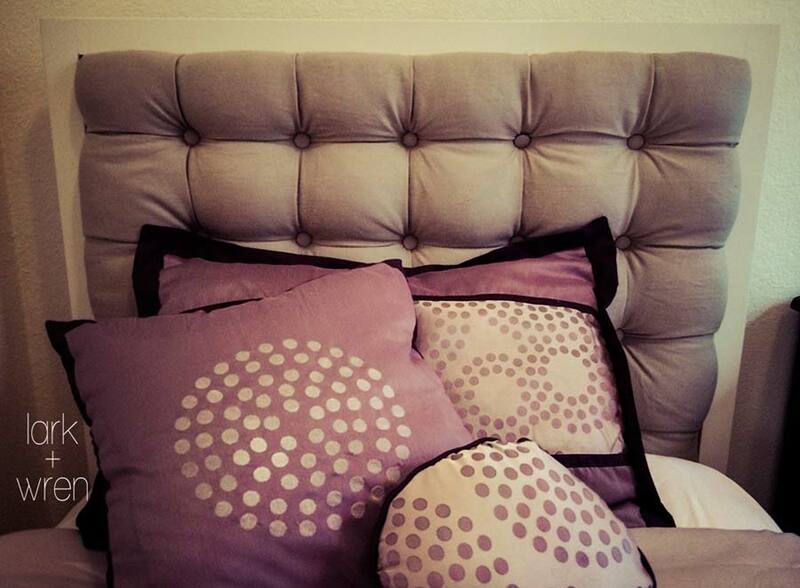 We opted for a squared off look to offset how girly the tufted headboard is. Decide how many tufts you would like and how far apart you want them. Decide between square and diamond tufts We chose square to match the square frame. Mark where each button will be and drill holes all the way through the MDF headboard with a drill and drill bit We used a 3/8 inch drill bit. Our headboard is 39×28, we have 4 rows of 5 totaling 20 buttons spaced 7 inches apart horizontally and 6 inches vertically. Line up the foam (which may be more than one piece depending on the size of your headboard) with he MDF board. With a pen, mark through the holes onto the foam. 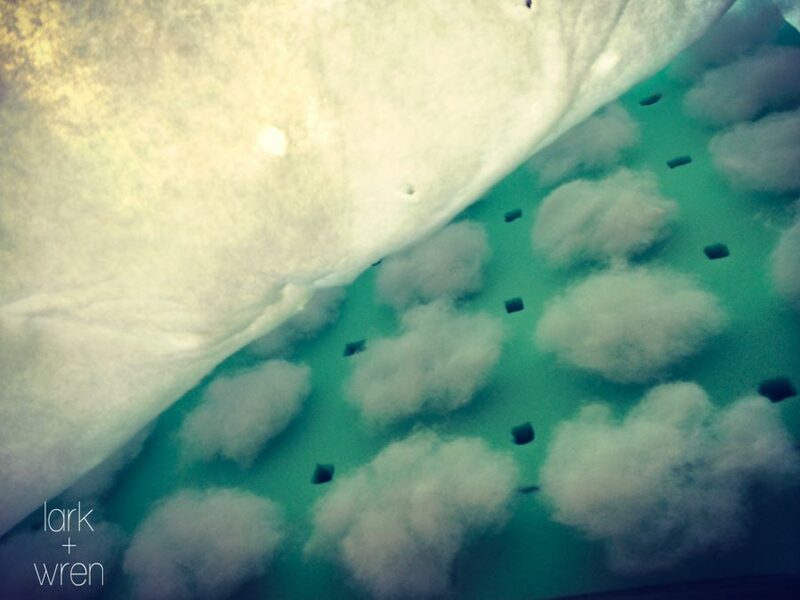 Cut holes in the foam about the same size as the buttons with a pair of scissors or a knife. 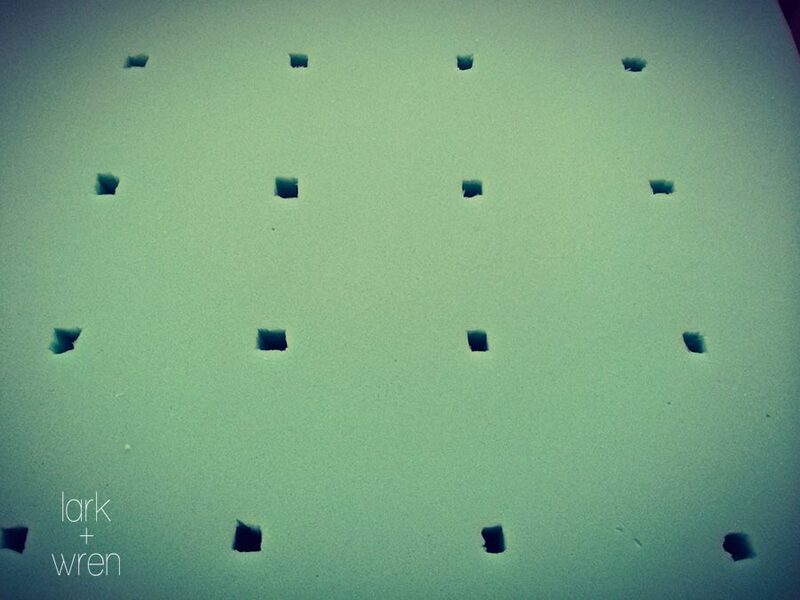 Once the holes are made, line up the foam and the MDF and glue together with the spray glue. This will ensure that it does not move! I found that to get the perfect tufted look it was best to add balls of fluff in the middle of each tuft. I carefully added the quilt batting on top, adjusting the balls of fluff accordingly. 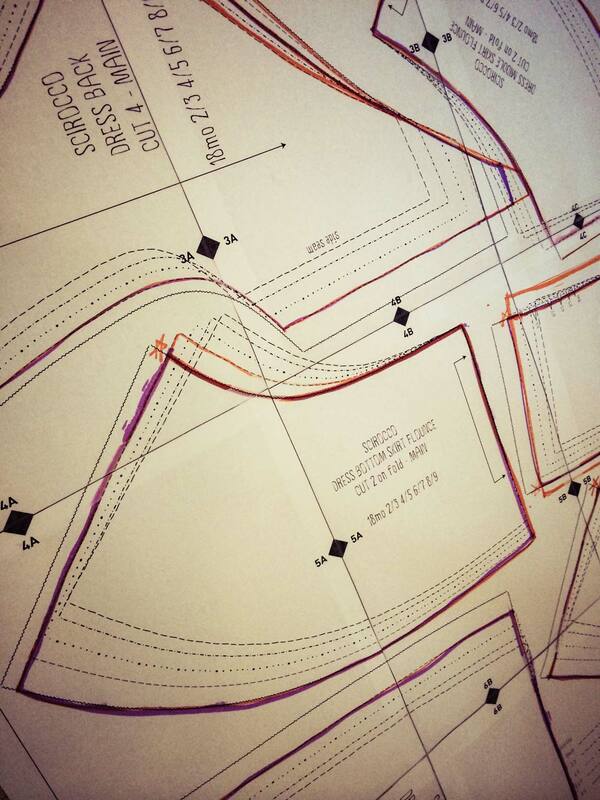 Now is a good time to make the cloth covered buttons. I ended up having to hand sew mine on as the fabric was so thick- taking me about 2 hours! In the beginning, we tried following the instructions of sewing the buttons to the headboard to make the tufts, but they kept breaking. Eventually we ended up sewing smaller, shirt sized buttons on with the waxed thread and upholstery needle to make the tufts, and then sewing the decorative buttons on afterwards. Step 5 – shaping the tufts, was by far the hardest part. 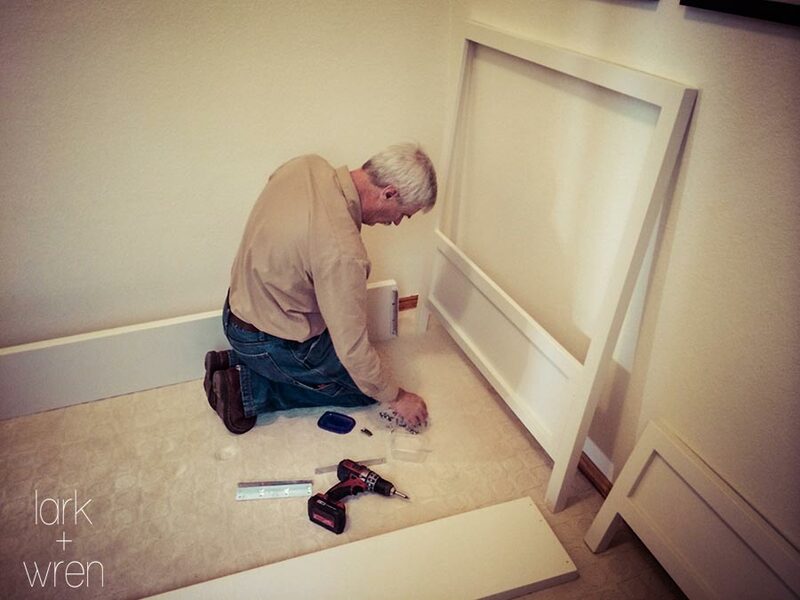 My dad ended up helping more than he thought he would as it needed so much strength! We placed the foam topped headboard on two sawhorses so that we could get underneath. After gently smoothing and softening, we pulled the button into the foam hole with the upholstery needle, and wax thread. My dad, being the strength, pulled the wax thread underneath the headboard until I told him the depression was sufficient (and eventually, evenly depressed with the others – as this is no easy feat) and he would then staple the excess thread to the headboard in a W pattern. Surprisingly, the quality of the tufts was not determined by the depth. In fact, we barely pulled the buttons into the foam. The extra fluff and quilt batting is what made the tufts look full and round. The 20 tufts took about 3 hours to make, but it was worth every minute! After the tufting, assembling the headboard was a breeze! After a little more smoothing and softening around the edges, we trimmed the excess fabric and stapled it to the back. The headboard was complete! All we had left was to assemble the rest of the bed and marvel at our masterpiece.